UODA seeks to expand its horizon through various academic collaboration with different universities overseas. One of the collaboration was with Oklahoma State University in USA. The Dean of Southwest Oklahoma State University, (insert name) visited UODA with the objective of strengthening ties between the two Universities and towards promoting Pharm.D. 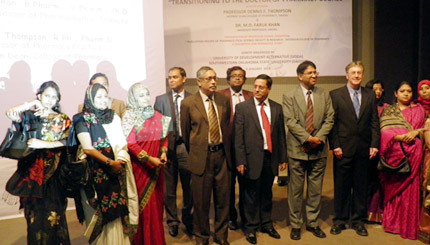 (Doctor of Pharmacy) degree in Bangladesh. A seminar was given by the Head of Department (insert name), of the Department of Pharmacy in Oklahoma State University on the scope of academic collaboration with their University. Following a round of talks, the two Universities signed a Memorandum of Understanding, which called for academic exchange and research collaboration between the Universities as well as full support of Southwest Oklahoma State University to promote the establishment of Pharm.D degree at UODA, which will be at level with Pharm.D. degree in American Universities. The photograph shows the team from Southwest Oklahoma Stae University visiting UODA.